Contrary to what you might believe, being a dapper dude doesn't take that much time. 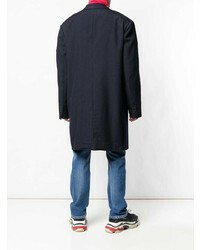 Just consider teaming a Balenciaga Washed Db Jacket with black jeans and you'll look great. When it comes to footwear, this ensemble is complemented wonderfully with brown leather brogue boots. As you can see here, being a dapper dude doesn't require that much effort. 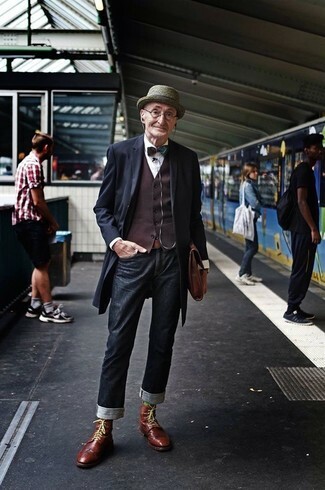 Just wear a navy overcoat with white chinos and you'll look amazing. Why not introduce brown suede chelsea boots to the mix for an added touch of style? 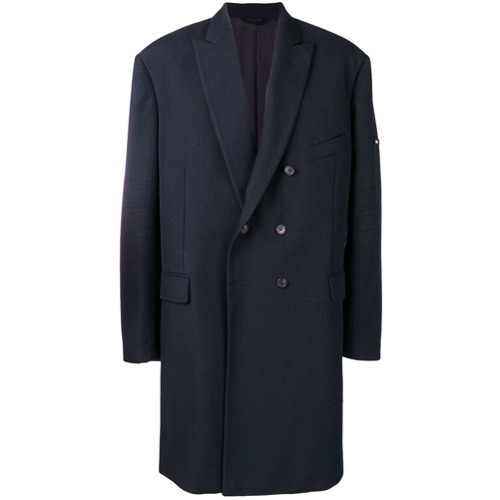 A navy overcoat and a dark brown three piece suit is a greatcombo for you to try. Opt for a pair of dark brown leather double monks for a more relaxed aesthetic. If you're on a mission for a casual yet seriously stylish getup, consider teaming a navy overcoat with light blue ripped jeans. As well as very comfortable, these garments look fabulous when paired together. Complete your outfit with brown leather low top sneakers. 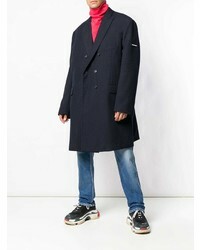 For a nothing less than incredibly stylish outfit, make a Balenciaga Washed Db Jacket from farfetch.com and a grey suit your outfit choice. 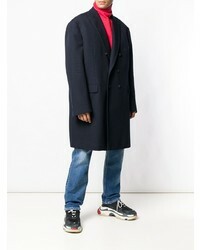 If you're on the lookout for a casual yet on-trend getup, consider teaming a Balenciaga navy overcoat with black sweatpants. These garments are very comfortable and they will also look stunning paired together. For something more on the daring side to round off this outfit, rock a pair of white leather low top sneakers. Such pieces as a Balenciaga navy overcoat and navy chinos are the perfect way to infuse extra class into your day-to-day outfit choices. For something more on the daring side to complete this getup, make red suede low top sneakers your footwear choice. Such pieces as a Balenciaga Washed Db Jacket and blue jeans are the ideal way to introduce some class into your daily wardrobe. Brown leather casual boots complement this getup quite well. This combination of a Balenciaga navy overcoat and burgundy chinos is super easy to make up in seconds time, helping you look amazing and ready for anything without spending a ton of time rummaging through your closet. White plimsolls will add a more relaxed feel to your look.